Eight teenagers stranded at an abandoned farmhouse become the targets of a cannibalistic serial killer from local legend. Michigan, 1977 – A frightened young woman flees from the Joad farmhouse, but is caught from behind and killed. Broomfield, Michigan – 1984 – Teenager Adrienne lies to her father Norman about a sleepover with her friend Jamie and secretly steals the key to Norman’s remote hunting cabin. Outside the high school dance, Tobe hotwires a school bus. Adrienne and Jamie sneak onboard with their friends Marilyn, Wesley, Sean, Heather, and Johnnie. Heather secretly brings her dog Precious with her in a handbag. Vice Principal Frank Cunningham sees the teens on the bus just as it pulls away. Junior Joad, presumed dead with the rest of his cannibal family, kills a squatter inside the seemingly abandoned Joad farmhouse. The school bus runs out of gas in the middle of nowhere. Tobe and Marilyn go looking for help while the others stay behind. Tobe and Marilyn stumble upon the farmhouse and return to the bus to tell the others. Cunningham visits Norman to tell him about his daughter and her friends stealing the bus. Norman sees that his cabin key is missing and deduces that the kids are going to the woods. The eight teenagers get to the house and pair off to explore the premises. Tobe and Marilyn get to know each other while looking for gas in the barn. Heather scream when she finds a shrine made from human remains upstairs in the house. Marilyn runs back to the house while Tobe stays behind to find his dropped glasses. Junior Joad attacks Tobe. The other seven friends gather at the shrine and recount the urban legend of the Joad family being cannibalistic serial killers who reportedly died in a standoff with police in the seventies. Adrienne finds a peace sign necklace among the shrine’s trinkets that belonged to her sister Laurie, who she always thought had run away from home. The group goes outside and sees Tobe tied to the barn door with barbwire. Adrienne rushes towards Tobe and Junior Joad emerges to put an ax in her stomach. The others return to the house and regroup. While coming up with a plan and looking for alternate routes of escape, Sean becomes trapped in the basement and is killed. Everyone else flees and scatters outside. Wesley and Marilyn hide together. Junior Joad reaches through a window and kills Wesley by forcing his eyeball down onto a shard of glass. Marilyn flees. Johnnie and Heather hide in a broken down car. Heather snaps her dog’s neck when Precious won’t stay quiet. Junior Joad puts a pitchfork through the car and kills Heather. Johnnie tries to crawl away, but Junior Joad drops the car on top of him. Jamie finds Marilyn and mentions how she was able to hit Junior Joad with a rock and escape the animal trap. Junior grabs Marilyn and bashes her head against a tree. Jamie flees and runs into Cunningham after he arrives on scene. Jamie hides in the house while Cunningham prepares to face off against Junior. Junior swiftly decapitates Cunningham and continues his pursuit of Jamie. Jamie makes it back to the bus and fights off another attack from Junior. Norman arrives just in time to shoot Junior Joad repeatedly. In the aftermath, Junior is zipped into a body bag and taken away in the coroner’s vehicle. After speaking to Sheriff Cam, Jamie is taken away in an ambulance. She later sees the coroner’s vehicle disabled on the roadside with Junior Joad’s bloody gurney lying empty outside the back doors. 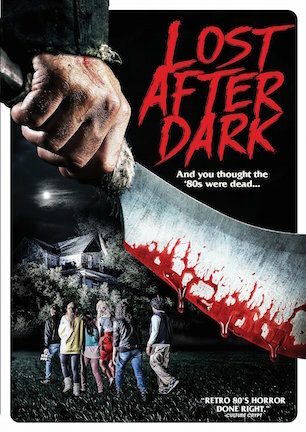 Countless imitators have laid claim to being a throwback 80s slasher homage with an authentic retro feel, but “Lost After Dark” is the real deal. Letterman-jacketed good guy, leather-jacketed tough girl, stuck-up prom queen, and assorted stereotyped pals looking for a private place to party. Urban legend about a cannibalistic serial killer haunting an isolated farmhouse. Sure, you’ve seen movies like this before. And that is precisely the point “Lost After Dark” intends to play with. In 1984, four teenage boys (Johnnie, Wesley, Tobe, and Sean) team up with four teenage girls (Jamie, Heather, Marilyn, and Adrienne) to skip out on the school dance, hijack a school bus, and find a remote cabin in the woods to get their wild weekend on. If you’re curious which four boys pair with which four girls, I would say think of the most well-known slasher films of the 1970s and 1980s and match each director with his Final Girl, except “Lost After Dark” switches two of the couples for some reason. That longer variations of certain names are used instead of the more obvious John and Wes is the first clue about how the film’s homage nods reside in plain sight without being explicitly in your face. The bus breaks down of course, and the only refuge around is a dark and spooky farmhouse, abandoned since a 1977 standoff ended with police slaughtering the notorious Joad family of cannibalistic killers. After seeing them sneak out of homecoming in hotwired high school property, vice principal Cunningham goes in hot pursuit of the troublesome teens. But so does Junior Joad, not as dead as the town thought, and none too pleased about trespassers on his family’s farm. “Lost After Dark” is just one can of Tab and a Huxtable sweater short of being filled to the brim with every 80s trope conceivable. The lone black kid sports a hair pick in his afro. The virginal Final Girl rocks a pair of Keds. Crimped hair, rotary phones, Rubik’s cubes, Reagan portraits: it’s all here. Someone even says, “life’s a beach.” Yet no matter how high the retro references pile, it somehow never feels like too much. Credit director Ian Kessner and his co-writer Bo Ransdell with striking the right balance between horror and humor to make a movie both charming and chilling. The script’s tongue teases the inside of its cheek, but the actors never open their mouths to turn at the camera and wink. Because the cast, which is uniformly outstanding for young actors poured into familiar molds, plays the material straight, “Lost After Dark” remains reverential to the genre while retaining only a subtle sense of humor. That sensibility is what makes the movie fun without being silly, spoofy, or over-the-top outrageous. The presentation gets in on the act, too. Fogged film and clunky editing splices accompany reel changes. Dirt, hair, and scratches accent a grindhouse vibe. Yet once again, these gags last only long enough to prompt a quick snicker and a smile before overdrawing any undue “look at me!” attention. As for the slasher element, the story is straightforward with intentionally predictable plot beats. Where “Lost After Dark” is unpredictable is in how it wreaks havoc on audience expectations by getting creative with the way it whittles down its roster. The teens are deliberately not killed in the order you think they should be, which might be a spoiler to mention, and that is how Kessner and company keep you on your toes in spite of following a specific formula. Aside from a story that isn’t terribly deep, although it really isn’t supposed to be, the film’s only real drawback is an occasionally mistimed sense of pacing. Proceedings take their time getting off the ground (which granted, the movies being mirrored had a tendency of doing themselves), but there are also some dragging lulls in between moments of mayhem that could do with improved tuning. Something that isn’t off however, is the timing of the movie’s arrival. “Lost After Dark” is a shot in the arm for slashers as well as for trendy meta-movies commenting on specific filmmaking eras. This is retro 80s horror done right, and done respectfully. Even though it isn’t a comedy, the movie requires a sense of humor for full effect and maximum appreciation. If you’re of a certain age and of a certain mood, “Lost After Dark” is a perfect fit for any movie marathon featuring your favorite “Friday the 13th,” “Nightmare on Elm Street,” and “Halloween” in the same rotation. Spike a pouch of Ecto Cooler with Captain Morgan’s, pop the top on a box of Bugles, and enjoy a fresh flashback to when horror was fun as well as frightening.